It Doesn't Get Better than This! 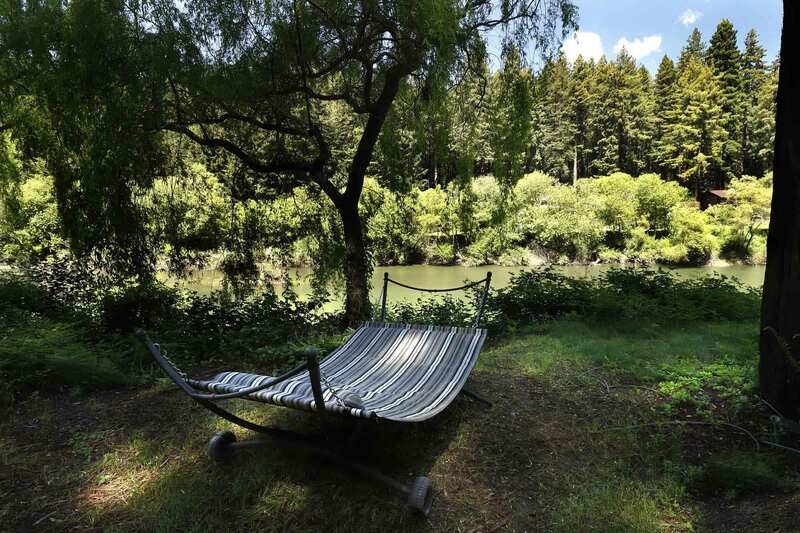 Splendidly Restored 1910 Victorian Historic "Camp Como", 1.6 Riverfront Acres, Redwoods, Hot Tub, Lawn, Landscaped Gardens, *Seasonal Private River Access and Boats; Walk/Short Drive to Downtown Monte Rio, Beach, Dining. Short Drive to Golf, Wine Tasting, Coast, Hiking. Cable TV, Wi-Fi, Landline Phone, Cable TV. Keyless Entry. Your Well-Behaved Dog is Welcome! On Como's upper level, the unique double living room offers two comfy seating areas and opens to the main deck overlooking a gracious sweep of lawn and the river beyond. The kitchen also opens to the deck and has eat-in dining. Steps lead from the upper deck to the rear yard. Off a short hallway from the living room, there are two bedrooms and a bathroom. 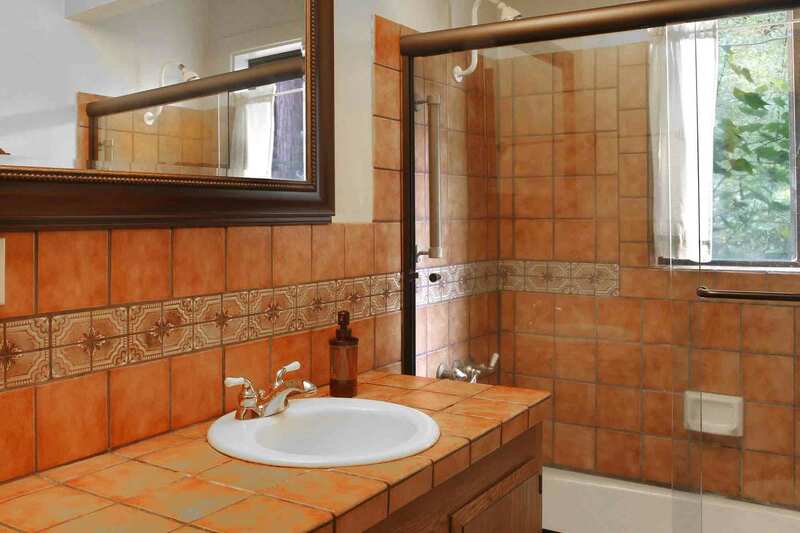 The second bathroom is directly off the living room. Interior stairs from the living room lead to the the lower level, with two bedrooms (one has no privacy from the stairway or the other bedroom entry the stairway) and an exit to the rear yard and hot tub. From the yard, there's a path to the *seasonal river access. Note that the lower level rooms are sub-grade and can be damp in the winter. "Great location and a lot of amenities." Great location and a lot of amenities. "A beautiful spot for a romantic getaway"
A beautiful spot for a romantic getaway on the river, an exciting rafting/hiking/biking trip, or a nice touring of beautiful wineries. The layout is great for 8 to 10 people with four bedrooms (two separate rooms upstairs, two open space bedrooms downstairs). 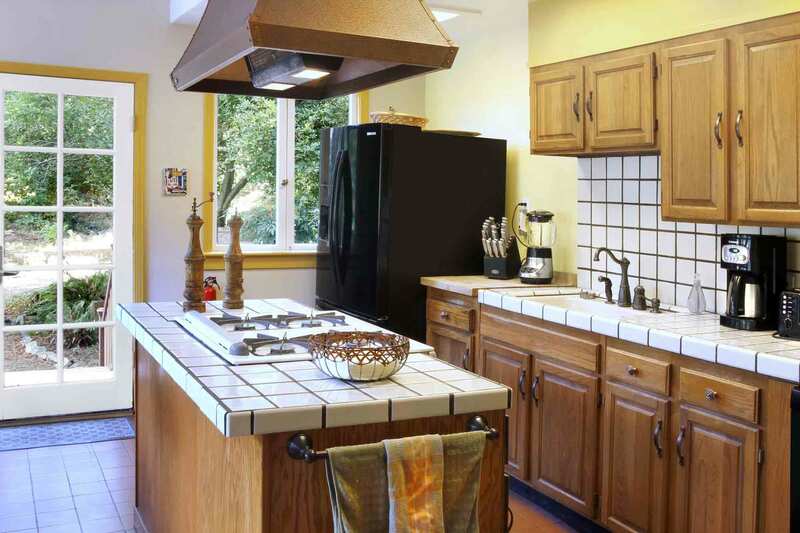 Kitchen is large with all the amenities to cook large breakfast and dinners. 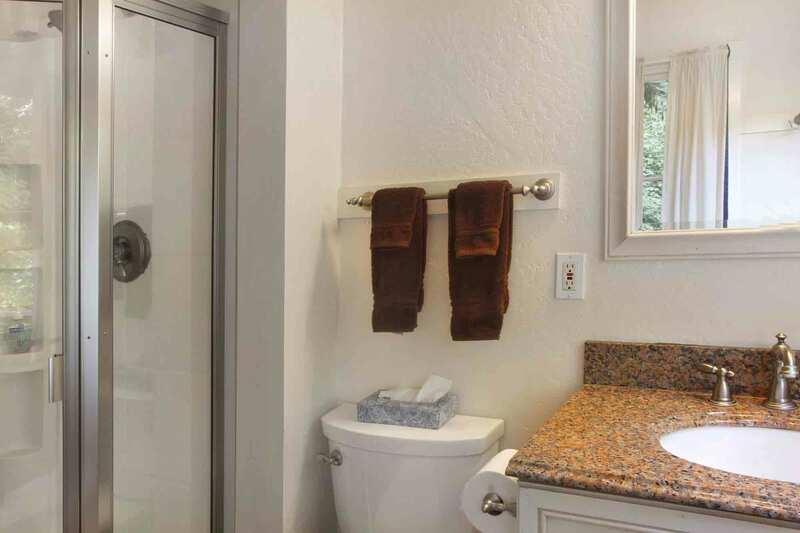 Two full bathrooms makes it easy for everyone to get ready for what the day may bring. Everyone in our group was so happy that we are starting to plan a trip in the summer. Definitely check it out! "The house is beautiful and was perfect for our Thanksgiving." The house is beautiful and was perfect for our Thanksgiving. Kitchen had everything. Warm and comfortable with plenty of space. Overall a great space and we hope to stay again. "great place to stay, plan to return!" great place to stay, plan to return!
" Perfect spot for a larger group"
Great house right on the river. Perfect spot for a larger group. I would stay here again! 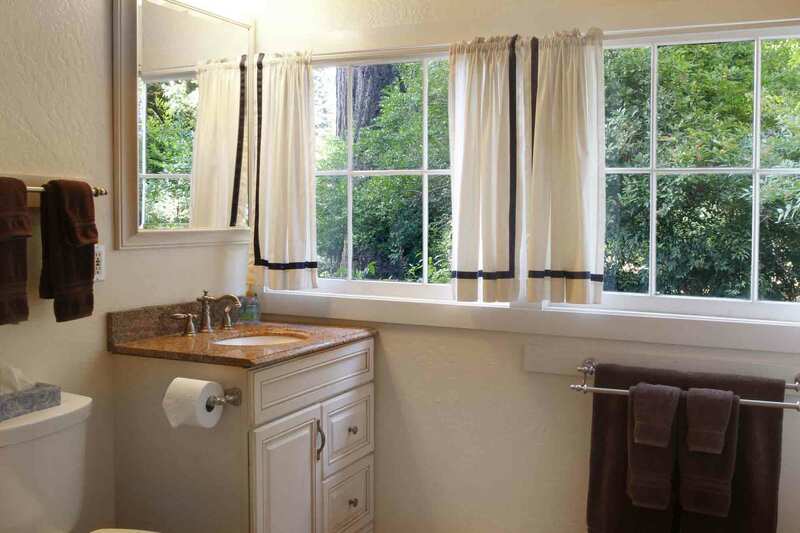 "Spectacular location on the Russian River!" 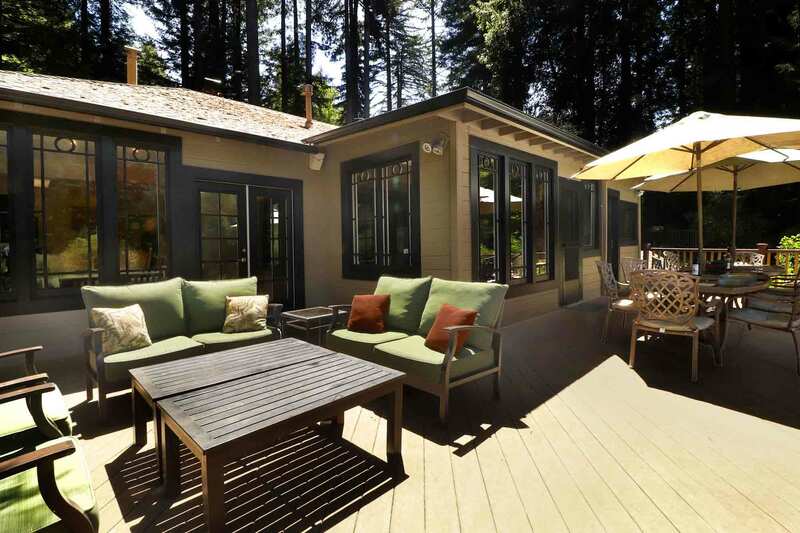 Spectacular location on the Russian River! The interior of the house isn't fancy, but it is comfortable and roomy. There are 2 bedrooms and 2 bathrooms upstairs. The 2 bedrooms downstairs are less private, and there is no bathroom downstairs. One of the downstairs bedrooms (king) has only a curtain to separate it from the stairwell; the other bedroom (queen) also has a sitting area and television. Note: the cottage on the property is no longer being rented so be advised if the listing hasn't been updated. The views from the large deck are why you stay here. Outdoor furniture was very comfortable. There were 3 single kayaks and several blow up rafts for use. The pump for the rafts didn't work well so bring your own or buy one at the nearby hardware store. Location, location, location - we would stay here again. "This is a lovely home"
This is a lovely home. Very cozy and secluded... We had our annual family reunion here this year. Our whole party of 10 age from 10 to 85 enjoyed our entire Christmas weekend stay in this lovely fairy cottage. The hot tub was awesome. Communication with the host is very prompt. Will definitely recommend for family gathering, esp for summer! 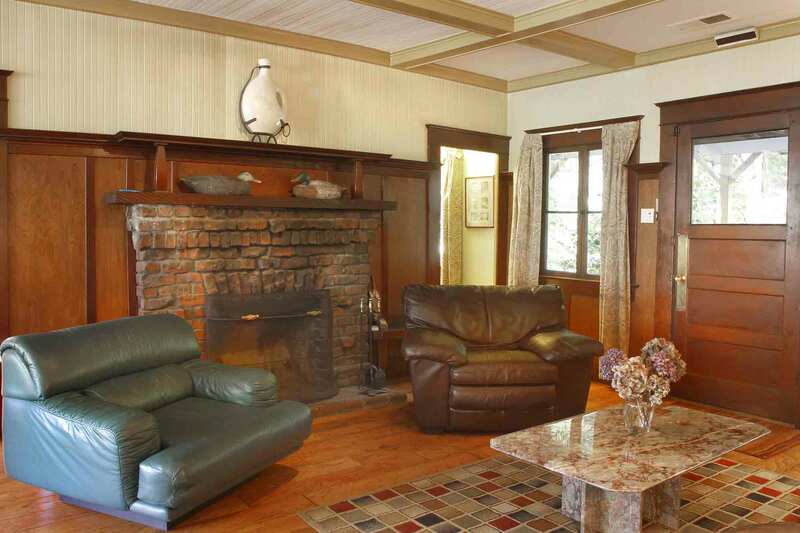 This is a lovely home on a quiet lot with beautiful giant trees and river. Everyone one in the family loved the location even may hard to find in an evening hour. Everyone enjoy the time spend in the area. Nothing is perfect, and there are few things the owner should take precaution. One of the showers is lack of water pressure as the pressure drop when someone using water in another area. The deck railing near the hot pool and the stair going down to the yard area isn't in the best condition. Grandparents almost fell as the hand railing isn't secured properly or loose. It is a safety issue. The access to the beach was not accessible for the elderly and the path without steps in some area. We didn't expect the condition lower than our expectation for the price we paid for the weekend. We had better stay at another place in the past family reunion. This was my 4th year renting Como Estate--prior years were great but this year was very disappointing--In July I called Russian River Getaways asking about the 'algae issues' the gentleman I talked to was very helpful and during our conversation I asked if he knew if the owners had done any updating or repair to the path leading down to the beach--I mentioned that "at my age it was getting difficult to climb such a steep path" (hahaha) anyway that's when he told me that the property was for sale and that 'no' there was no work done--upon arrival to Como Estate I was very upset to find out there was NO BEACH left-- I get that we had a lot of rain this last year and the river was higher than in the past BUT they still advertised "private beach" and in July when I talked to them they should have known AND told me there was no beach-- I rented this property purposely for the private beach--I have grandchildren and it's been very convenient to be able to have "naps, lunch, etc." without leaving the beach--Common courtesy would have been to inform renters of the change in beach access. Then Monday night right after dinner we heard a loud bang and the electricity went out--evidently a transformer blew--the 'security gate' wouldn't open -- didn't have any cell phone reception, the landline in the house was also dead, and there was not one flashlight or candle to be found--we didn't get electricity back until 9:30 the next morning--I feel that Russian River Getaways had to have known about the power outage yet they never even tried to check in and see if everything was OK-- There was a note on the refrigerator to use the left side of the handle when opening the freezer--the handle was broken and duck taped--that lasted about 4 days and then the handle broke away from the tape and just dangled--there was no dishwashing or laundry soap provided, there were about 40 (no exaggeration) wine glasses, and 6 drinking glasses-- the home sleeps 10-12 so we had to drink out of wine glasses-- the shower head in one of the bathrooms sprayed out all around the rim and the tub faucet in the other bathroom leaked. Even the overall cleanliness of the house upon arrival was less than expected-- cob webs, dust, etc. 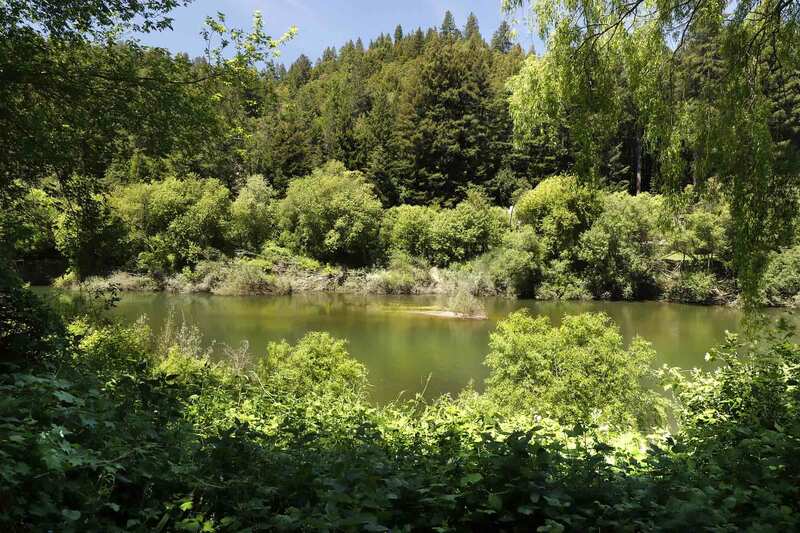 The Russian River itself is a gorgeous area and we enjoyed the peacefulness and beauty of the area but Como Estate was very disappointing this year. What a wonderful inviting home The grounds are absolutely beautiful. Everything we needed was there. Amazing vacation at an amazing place. Wish I could give more than five stars. In the words of my grandson "best vacation ever". Go stay, relax, enjoy and soak it all up. Lovely, wonderful, peaceful and inviting. Thanks so much for the review Lisa! "A hidden gem in a great location! " A hidden gem in a great location! 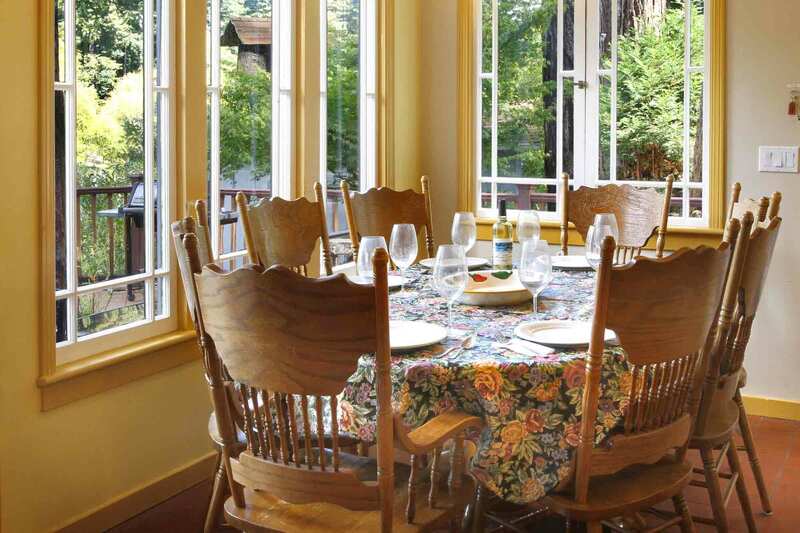 The house is at the end of the road in Monte Rio and overlooks Russian River from nearly every window. Even though there are other homes nearby, this property really has its own waterfront space and feels very woodsy and remote. A great place for 8-10 with plenty of space good social spaces both indoors and outdoors. 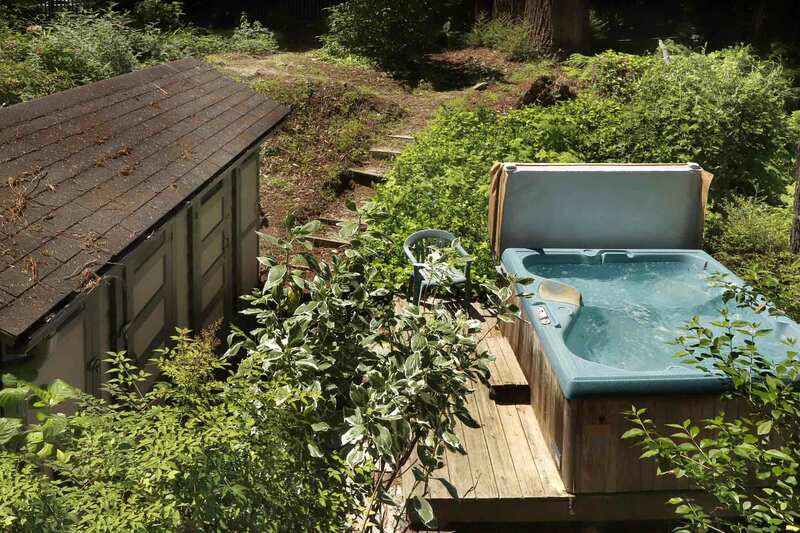 And of course -- how can I not mention the hot tub? A great wait to enjoy the beautiful redwood scenery, especially if the weather isn't nice enough for sitting out on the porch or hiking. 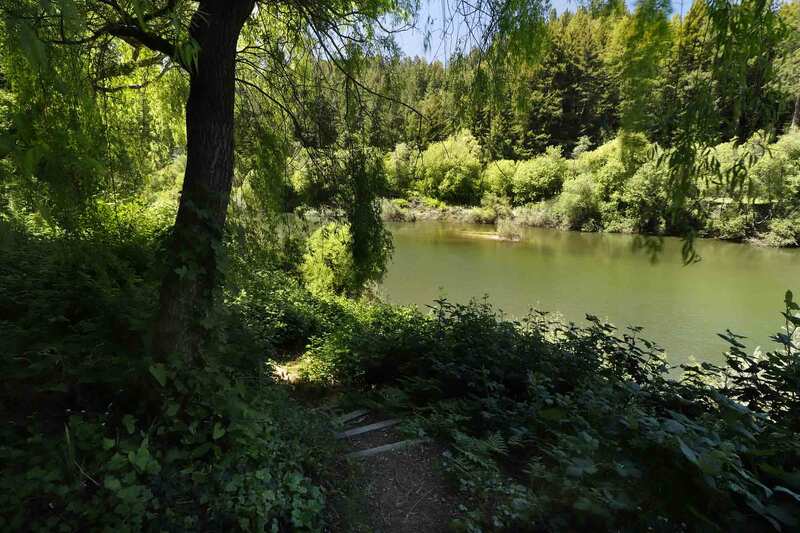 The place was charming and the location on the river bank and among the redwoods was magical. It's was even nicer than in the pictures. We were worried about the cabin and the bedroom at the bottom of the stairs but both were totally fine. The cabin is a bit musty, but its really cool, so as long as the person(s) staying there isn't prissy, they'll love it. The large room with the couch and the bed at the bottom of the stairs are conjoined. The large room has a sliding door which offers some privacy. The other has a curtain and you have to pass by it on the way down the stairs to the the other, so it isn't private but was fine for a single person. I would definitely go back. Cute, cozy and quite. This house was great for our girl trip. I will be coming back with my family. The space was plenty of room for 5 people and many more. The hot tub was tucked away under the trees and on the raining evenings we were here it was perfect. The cottage outside was not used but was so cute in its rustic charm. This home gave you the feeling of being tucked away in your own private woodsy oasis. "Comfortable, quite property with well-stocked kitchen"
We had a great long weekend at Como Estate. The house is comfortable, the view is beautiful, and there was even a turkey pan. Would definitely go again. "Not at all as advertised"
We rented this for a group of 10, but the "cottage" was absolutely unusable. It is a shed that a bed has been placed in and has not been cleaned. There was dirt on the bed, cobwebs covering the entire place, with massive spiders and cockroaches. The main house was over run by ants in the kitchen. The linens on the bed were not washed and had hair plus other things on them. I understand this property is not the most modern or a luxury rental, but I would expect cleanliness and that there would be 5 livable rooms, which there are not. Completely disgusting. I would like to give this a rating of 0. "Gorgeous location and comfy house"
Gorgeous location and comfy house. Host was responsive and helpful. River is not easily accessible and kitchen needs some updated cooking tools. River Getaways was very thorough and diligent with check-in instructions and the estate was a great spot to spend the weekend on the Russian River. River access was incredibly easy from the property, and the hot tub made the vacation that much more relaxing. The house can comfortably accommodate 4-6 guests, but any more than that would be quite a stretch. The converted toolshed (or cottage) was not very well cleaned when we arrived, so we opted out of staying there. In addition, there is a bed at the bottom of the stairs with a curtain, but that doesn't really constitute a bedroom. During our stay, we had a couple of negative encounters with an on-call representative from River Getaways, but River Getaways resolved the issues expeditiously the next morning. Overall, the experience was nice and River Getaways did everything they could to make sure that we were well taken care of throughout our stay. I generally like Russian River Getaways as all places that we have rented from them in the past have been really good. This place, however, was not. It was listed as 5 bed/3 bath but the 5th bedroom (in the shack outside) would barely qualify as such. It did not even have any heating. Also one of the bedrooms on the bottom floor was just a curtained off storage area. The house was also not very clean and under stocked (we quickly ran out of kitchen paper). On top of that the furnishing in the living room made it bad for young kids (a few coffee tables with a loose glass surface and a dangerous wooden table). I suggest that they change that. In addition to that the hosts had the gardener come on Saturday morning and cause a lot of noise. He also sprayed the plants which made it dangerous for kids. On the positive side the outdoor area is great and the river is beautiful. We're glad you were able to enjoy the outdoor area and river views, Argyrios. We do try to provide extensive details about the home in the description including the rustic cottage and lack of privacy in the one bedroom downstairs. Thanks so much for providing your feedback! "Best house on the street!" The Como Estate exceeded our expectations. The view of the river is gorgeous and peaceful. The property is at the end of the road, so you feel like you're alone in the woods. The landscaping is lovely, and the house is nicely appointed with everything you need. The house itself is vintage, with dated kitchen, bathrooms, and furniture, but this was perfectly fine with us. We thought the cottage was the best room, but it is rustic. Plenty of room for 10 adults, both inside and out. Plenty of off street parking. Comes with kayaks and tubes too! We'd be happy to stay here again. Gated property with lots of space for wandering, and an unsurpassed view of the river as well as convenient river access. The quiet dead-end street was great for the kids on their bikes. The house had a super-large livingroom where the whole extended family could gather. Walking distance to a small grocery store. 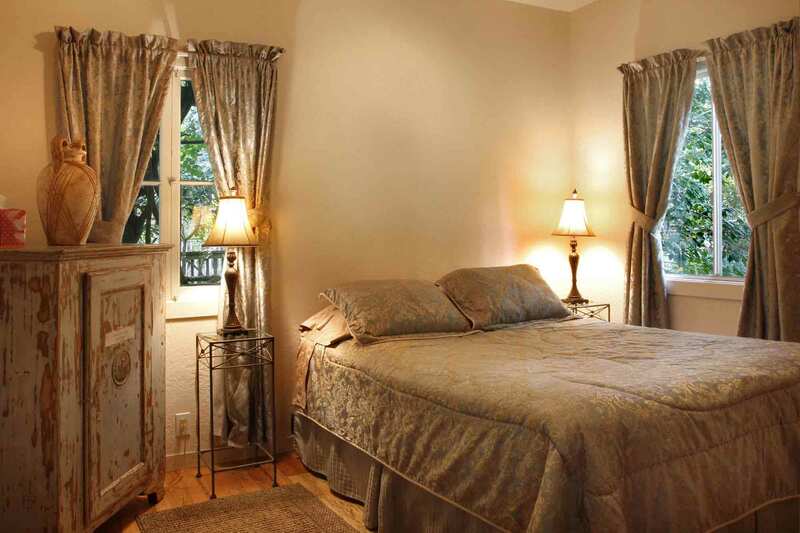 "Very Private - Best Property on the Street"
Overall this property was very enjoyable. The best part was the upstairs main living spaces (inside and out) as well as the grassy yard down below. Private river access and kayaks was definitely a plus. The kitchen was well stocked - even had a waffle iron. Criticisms - the river access was a muddy, steep trail, with no dock or beach. The downstairs bedrooms were musty and the outside cottage was very rustic. Maybe this is just the price of living on the river, but there were a lot of large spiders. From the begining everyone at RR getaways was very friendly and patient while helping me find the perfect house for my friends (10 people and 4 dogs) and I. We had many specifications. This spot met all of our needs perfectly,from the fully stocked kitchen to the private beach with kayaks. There were enough beds for 5 couples, unfortunately the downstairs rooms were still cold and musty in September. There is a dehumidifier and a space heater which helps somewhat. With that being said, that was really the only negative thing I can think of. 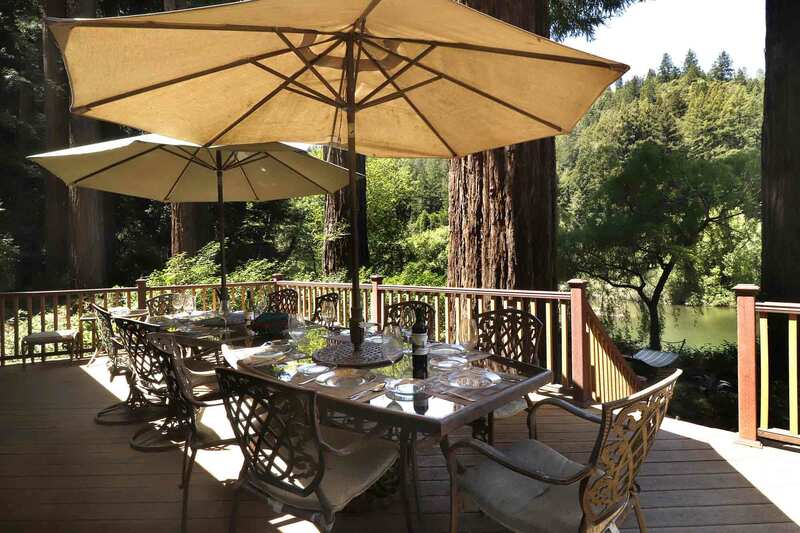 We all enjoyed spending time among the redwoods on the deck overlooking the river. The private beach was perfect, especially picking blackberries on the walk down. The kayaks were all well maintained, the only tricky thing was the lock.Honestly, my friends came up from Santa Cruz but my husband and I live 20 minutes from this location and both agree this vacation was well worth every penny. All of us agree to do it again next year, except stay longer. We will be back again next year! Everything was lovely again. We love this house for our group of friends and small children. It is charming and comfortable. The patio, yard and beach are the best - unbeatable! Only thing we are really not happy about is the Mon-Mon rental vs Sun-Sun like last year. 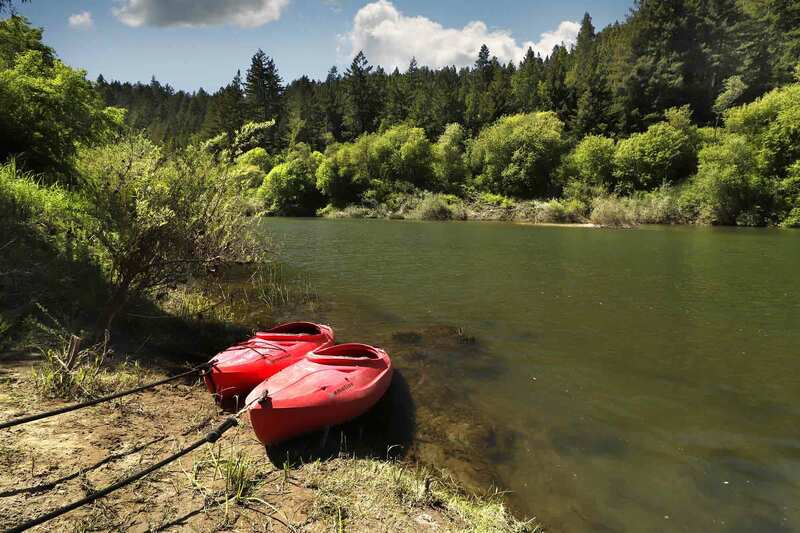 "Love the Russian River area!" This is the second year we stayed at Como Estate. We love the house at the end of the road. It accommodates our whole family (three generations) and even though it rained the first two days, we all found plenty to do. The only disappointment was the lack of a beach and lugging the boats up and down the hill. Last year there was a beach, and the boats were locked up on it, and it made for an easy ride. All-in-all, will return again and again. "Unforgettable experience -50th birthday party"
I spent weeks and weeks doing research, touring and making sure that the vacation rental I needed met my vision for my 3 day birthday celebration. Everyone at Rrgetaways was fabulous, super friendly, cordial, professional and handled all my questions and goofy requests expertly. Once my friends arrived, they too were completely enamored with the house, the setting and the natural beauty of the Monte Rio area. We made frequent trips to Goat Rock, to hike, run, take photos and catch the sunset -truly magical and unforgettable. Back at the house, we cooked several big meals -the kitchen had everything we needed- it made for a super easy and comfortable experience. Just one tip if coming out in January: bring extra blankets and make sure that the space heaters in the lower level and the outside cottage are turned on with enough time to make the space comfortably warm for you. But overall, we all agreed that we want to come back to the Como Estate and make this an annual retreat. Thank you again Rrgetaways for an excellent, first-time vacation rental experience. The Como Estate lived up the other review I'd read. We were a group of 2 families with some little kids. We did have to be careful about the stairs inside and out with the little guys, as we didn't want a long fall to spoil the incredible venue and all it had to offer. The place is comfortable, the beach and little islands on the river were too cool. Weather you want to hang out and relax the entire time or get out and enjoy all of the things the area has to offer, this place is ideal. Not cheap, but well worth it. "The family loved this place"
Como Estate was the perfect place for our family week. We range in age from 76 to 2 and this home was great for whatever we wanted to do. Rr Getaways service was friendly and efficient from the reservation through check in and check out. The kayaks had been reported to have leaks and someone came out the check them on our first day. Replacements arrived the next morning. The home and grounds allowed all of us spaces to enjoy together or guietly read or do yoga alone. The kitchen was fully equiped for making dinners for our large group. The grounds were beautiful with many interesting plantings. Since the property is located at the end of the street it was very private and quiet. The only thing I would change is to have a screen on at least one window or door in the master bedroom. "Good spot for annual friends get together"
We've been coming to Monte Rio for 12 years and have stayed at a number of properties. This is the best for outdoor areas/beach access. Basement rooms are musty and the cottage is a bit funky, but we'll deal with the issues and rent this place again. "Mostly great with lots of space to get away"
We really enjoyed our stay at Como Estate. The view from the deck and lawn was beautiful, and there were dozens of nooks where small groups or individuals could be away from the group.We only had three criticisms worth mentioning:1. The steps down to the half-silt beach were difficult for the small children and older members of our group. (But the water around the beach was shallow and great for our 3 and 6 year olds to splash in!)2. The kitchen was small, and there is no room in any cabinets to store food or supplies we brought. (But it does have a great refrigerator)3. The bath, trash bag and toilet paper supplies were pretty stingy. One set of towels per person with no extras, a bathroom rug that actually had holes in it, no bath soap, and not quite enough toilet paper and trash bags to make us feel comfortable that we wouldn't run out.But don't get me wrong - we might very well return to rent this house. It was charming, fairly comfortable, and we really enjoyed our stay a lot...wished we could've stayed longer. 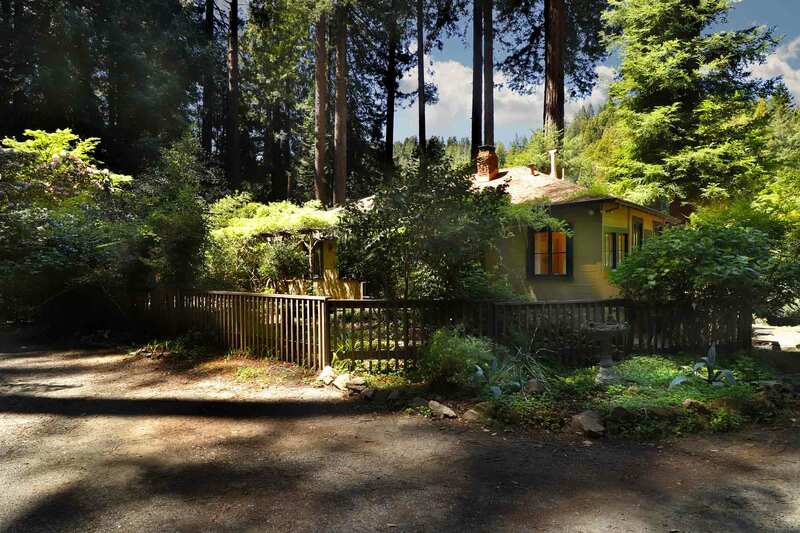 "Lovely rustic compound on the River"
This property is absolutely lovely for a large group with many different areas outside for relaxing under the redwoods. The river beach is large and gets sun in the afternoon in summer. The house itself is old and a little rustic, with only two bathrooms, one of which is not great. 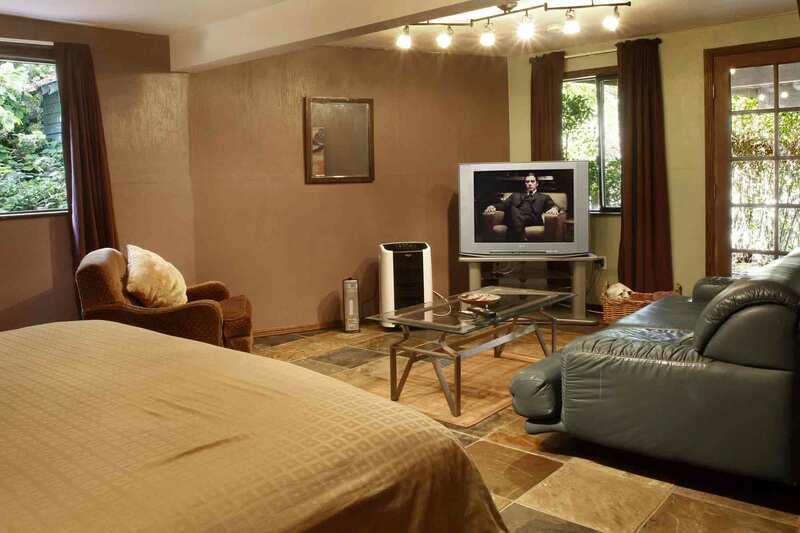 Two of the bedrooms are converted in the basement and are dark, damp and musty. If you have a lot of older kids in your group, that works nicely. The two main bedrooms are very nice. 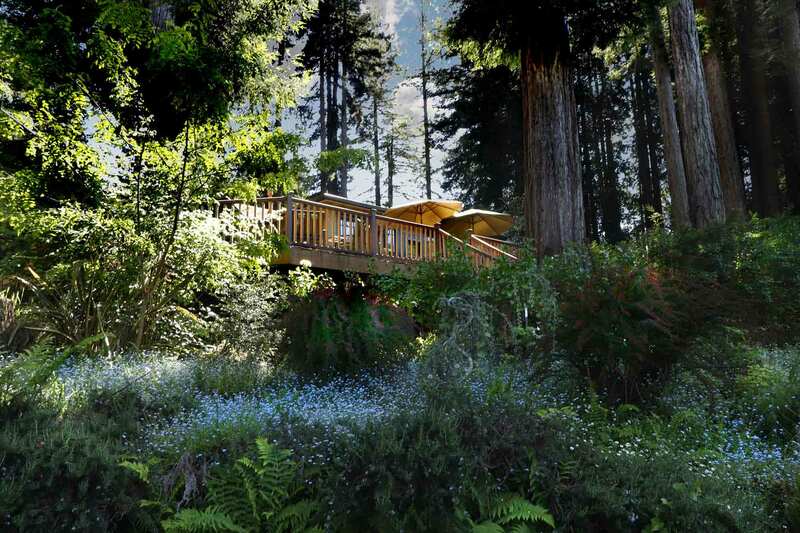 One bedroom is an outside cottage (no bathroom) which is lovely with its own deck and is built into a redwood trunk. The kitchen is great and pretty well stocked with what you need to make food for 10+ people for a week. We had a great stay and I would highly recommend it. I would give it 5 stars with the exception of almost half the bedrooms being musty. The hot tub was great too, and the bathhouse next to it, while rustic, does offer a third bathroom option. "Beautiful location, great deck and view, loved the hot tub"
The location is amazing! Beautiful vista of the river, at the end of a road, quiet. The landscaping is also beautiful. It was amazing enough that it seems petty to complain, but... the mildew and smell in the downstairs bedrooms made them almost uninhabitable for those of us with allergies. 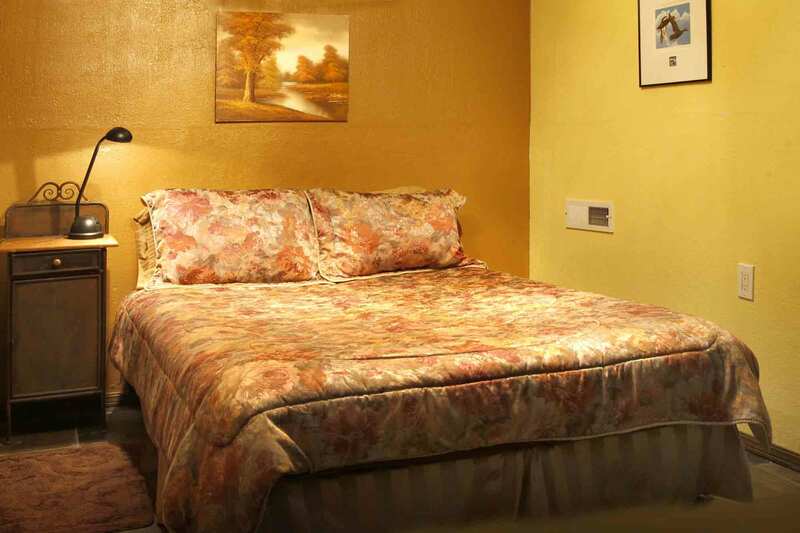 The bed with just a curtain is right off the basement and is particularly damp and moldy. We ended up sleeping outside on the incredible deck - but it was cold and not what we had planned. That aside - the house was great for accommodating our extended family. We really loved our time there. 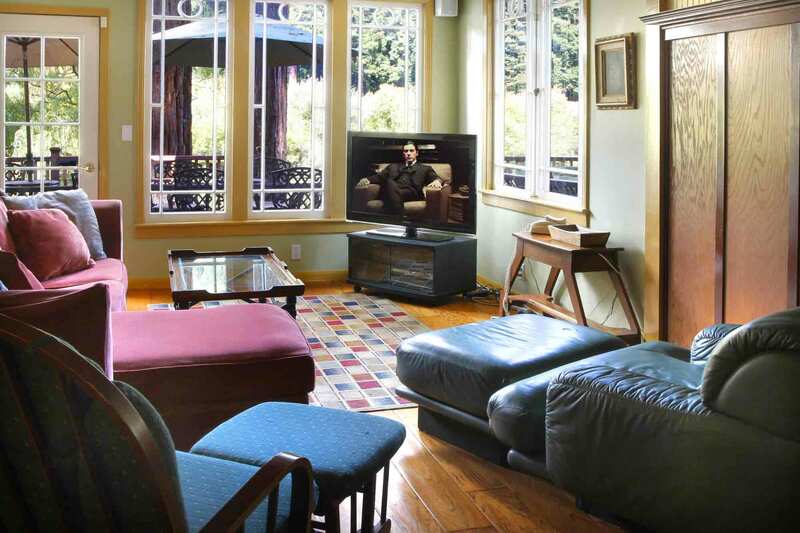 "A gorgeous property with all the amenities that a vacation home"
Como Estate was delightful! The house is at the end of the street on the river, offering privacy and incredible natural beauty. 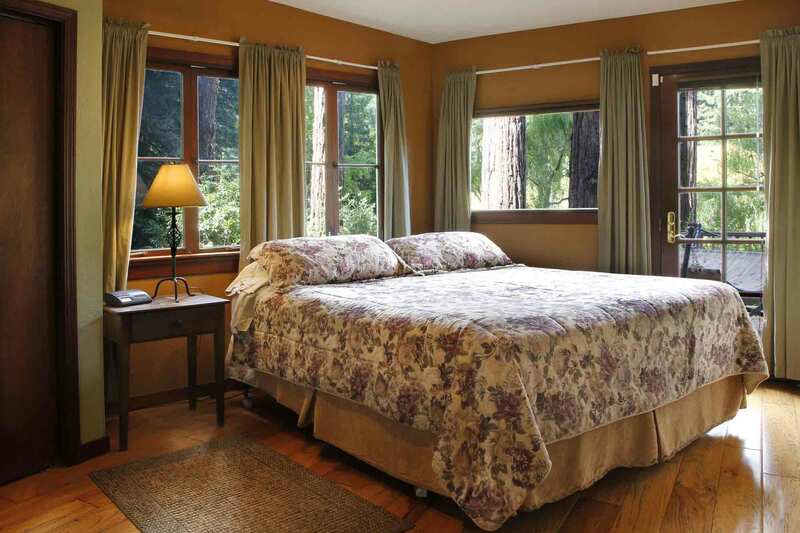 The property is surrounded by giant redwood trees and includes an adorable garden next to a jacuzzi. The backyard was beautiful...I did yoga on Saturday morning to the sounds of birds chirping and the scent of fresh invigorating air. As for the actual house, amenities were great. The only exception was that the lights to the deck were broken and the shower towels in the bathroom smelled like mildew. Otherwise, beds were comfortable, kitchen supplies were plentiful and in good condition, showers had strong pressure, and there was ample space for a large group of 10-14 people. This is a truly great find and a perfect getaway to come to with friends for a long weekend of relaxation and good company. We played guitar, drums, and did a potluck dinner on Saturday night in front of a fire. Not bad for a 28th birthday! "Review of Como Estate-Stayed with 7 adults and 3 kids [one was"
We look forward to our family vacation at the Como House every year. We have tried others but NOTHING compares. It has become a second home for us. We also appreciate all the upgrades, on demand water, bigger TV, new games, more water equipment. Thank you as always! This year was the best so far! 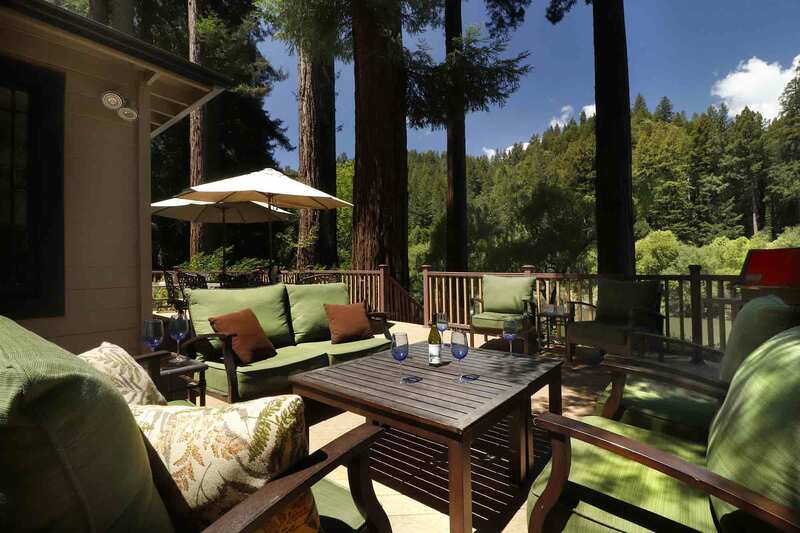 Como Estate is a wonderful property right on the Russian River. It provided everything a family or two families could want in a vacation home, including a great deck, a private beach, a well-designed yard, and plenty of bedrooms. When we complained about the hot tub water being murky, a serviceman was sent out immediately to drain and refill the tub. We only had two small problems: there was a chair that had been taped back together, and it collapsed when my brother sat on it. Also, one of the kayaks (the blue one) took on water, so I sank in the middle of the river. (I'm not that heavy.) Other than that, the place was spectacular. This is a beautiful place to enjoy the tranquility and peacefullness of the river. We ate all our meals there, but enjoyed one night out at the nearby restaurant...Highland Dell. The only drawbacks of Como were... not enough screens on doors and windows to keep mesquitos out, and we did not use the kayaks because getting them up and down beach trail would be pretty challenging ! I highly recommend this property and be sure to check out the adorable little cabin !!!! !